If you’ve been using Twitter for any length of time, you’ll know that having conversations is the heart of any social media marketing strategy. Twitter is a little different from other social media platforms in the way it works. For example, it allows you to jump in and out of conversations seamlessly without annoying anybody, upsetting anybody or getting on anybody’s nerves. 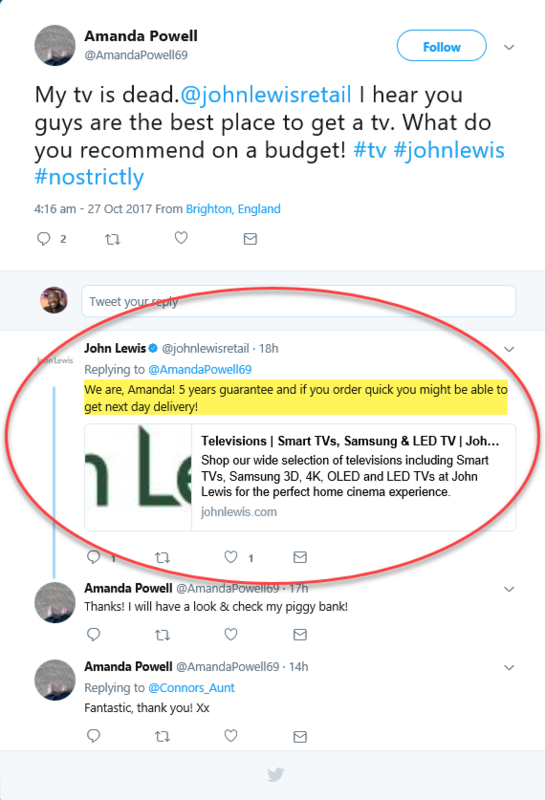 For this reason, Twitter remains the dominant social media platform to get your message across to prospective clients for your small business. The best way to make engaging and retweeting a habit is to spark off conversations with people who are already having conversations with you daily. For a large brand to do something like this is simply amazing. You need to do exactly the same for your Twitter account. This is done by checking the “notifications” tab on your account frequently or simply typing your Twitter handle into the search bar to find all conversations, questions and comments using that particular handle. When somebody follows you on Twitter, it’s a good idea to have a look at exactly who is following you and the best way to do this is checking out their profile. Now, if you like their profile and they are in a similar niche to you, it’s a good idea to follow them back. It’s also a good idea to retweet some of their tweets, especially if it relates to you but you can also go the extra mile by adding a comment to the tweet that you are posting. So, not only are you sharing valuable content that your followers will like or love, but you are also giving a thumbs up to the person you have just followed. 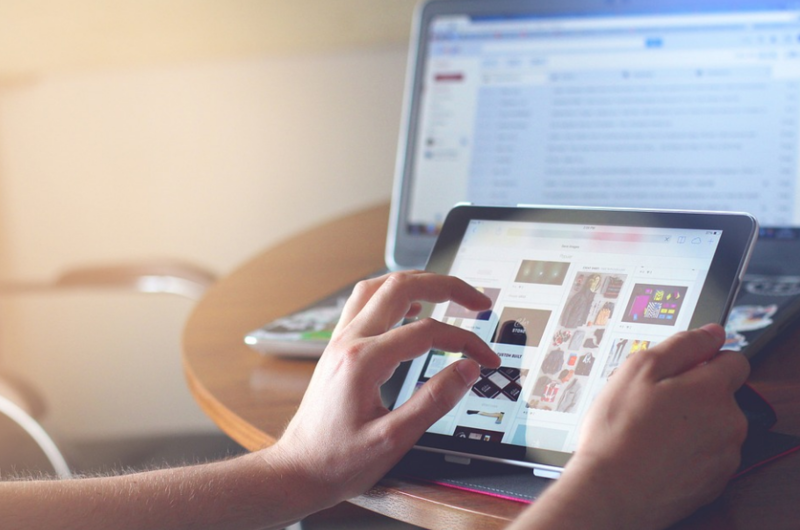 No matter how large or small your business is, the ones that produce great, informative content on a regular basis have the greatest chance of actually increasing their following and increasing engagement. There are several ways to produce this type of content but one of the best ways I’ve seen, and what I personally use, is a set of curation tools that are both free and paid for. I use a combination of Feedly and Buffer. 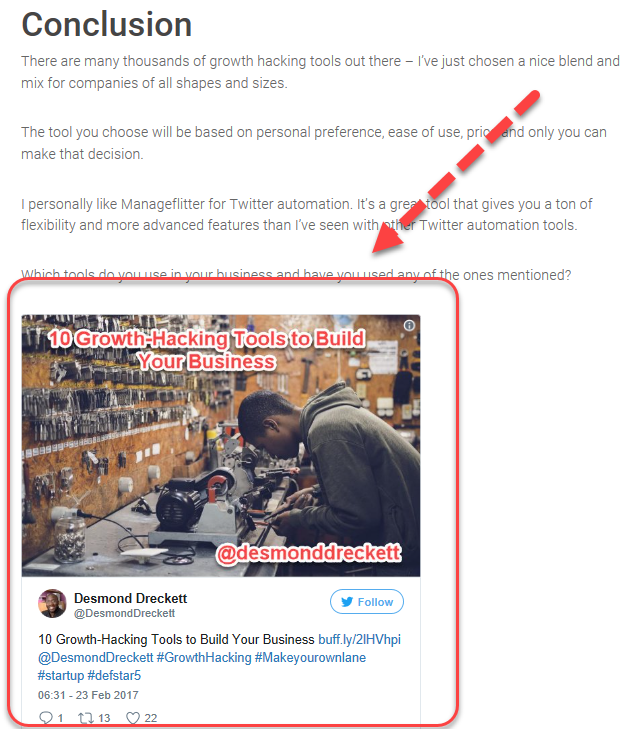 Now, Feedly is free to use and Buffer has a free subscription that gives you limited access, but if you really want to take your social media marketing seriously on Twitter, you really need to go for the paid version. You may or may not have noticed that there’s a little “#” symbol on your keyboard? This symbol is what we call a hashtag and is widely used to categorise your content on Twitter. This makes it really easy for both your followers and people who don’t follow you to discover your content simply by using the right hashtags in your tweet. 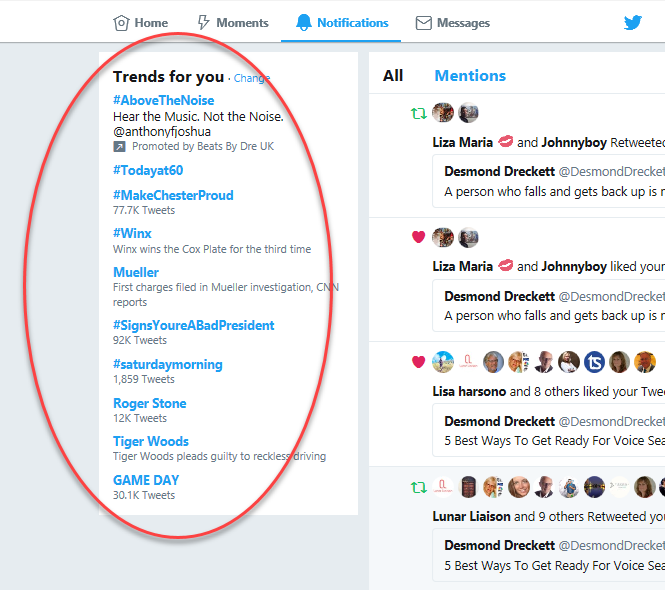 Keep on eye on tweets that are trending (normally on the left-hand side on the desktop). If there is anything trending that is close to a topic you have either written or are going to write about, take a note and use it in a tweet. This will get your tweet and content added exposure to potential clients. Where possible, try to produce your own hashtags or use industry-specific hashtags to further publicise your content. 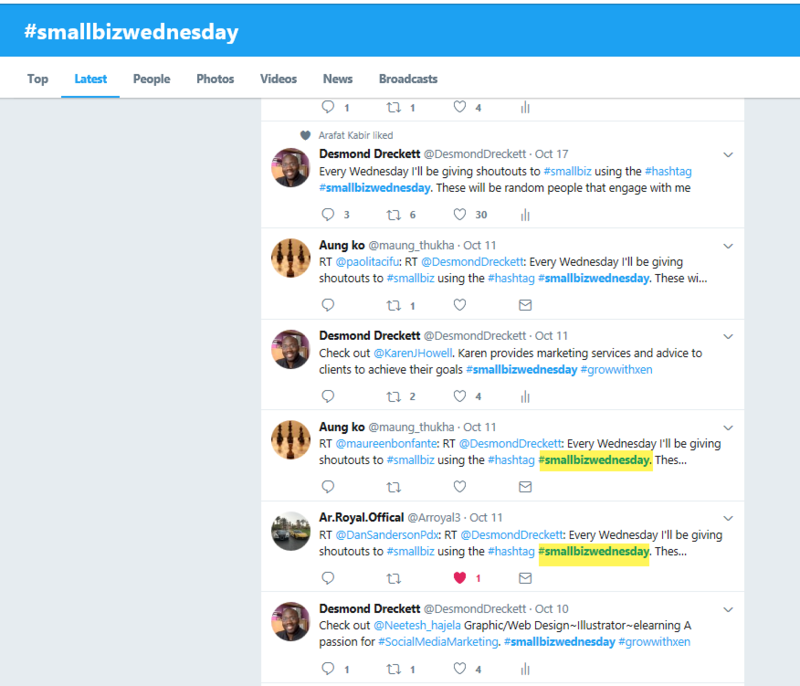 In the image below, I’m using the hashtag #smallbizwednesday. This isn’t one I came up with, but since I use it often, I have become one of the top accounts referenced by Twitter for that particular hashtag. Influencers on Twitter are the ones that are most engaged, produce the most content and help the most people on Twitter. Where possible you want to like, retweet and engage with these people and even spark up conversations. Now, if you’re not sure who these influencers are, try typing in your favourite hashtag in the search bar and see who comes up at the top – these are normally the people producing the most content in/around this area. The idea is to engage with these people as much as you possibly can and hopefully, they will reciprocate. When this happens, not only will you see your following increase on Twitter but you’re also likely to have increased engagement by an influencer’s followers. This is seriously powerful stuff! 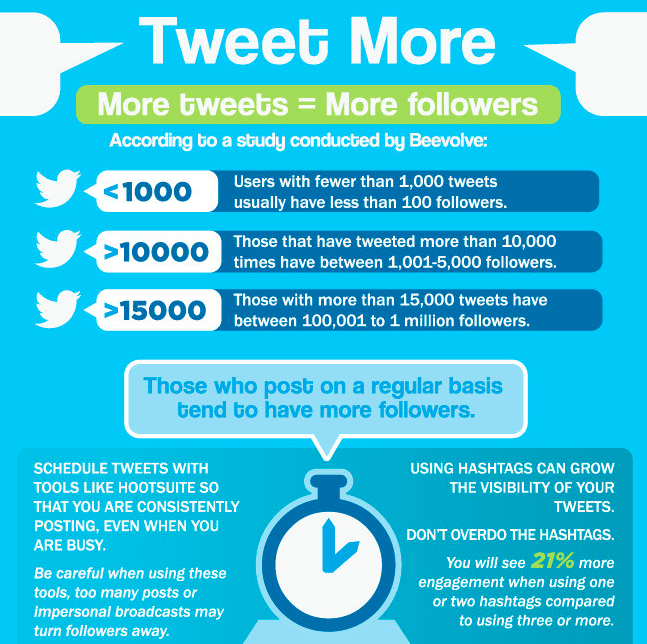 One of the fastest ways to increase your following on Twitter is to actually publicise your Twitter handle. 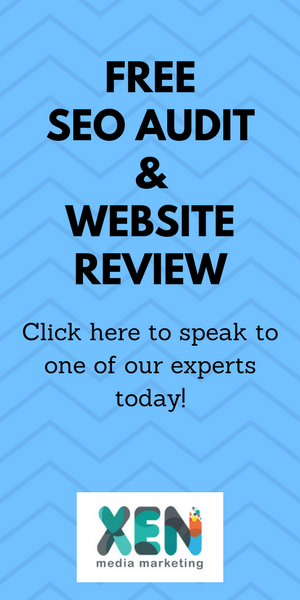 The first thing you need to do is make sure that your profile page looks as good as it can; this means using really great quality images for your cover image. This is the large image at the top of your profile. Also, make sure there’s a good quality company logo or a fantastic headshot that shows the majority of your head within the profile picture. Once you’ve done this, you need to be very clever with your bio. You don’t want to do what everyone else does, which is to list all the things that you offer within your business. This is the wrong way to go about publicising your Twitter handle. When somebody comes across your Twitter profile the main motivation is “what’s in it for me?” So, in a brief sentence, you want to explain specifically what you do but you also want to make your bio as appealing as possible to your target market. The image above shows you how to write for your audience. 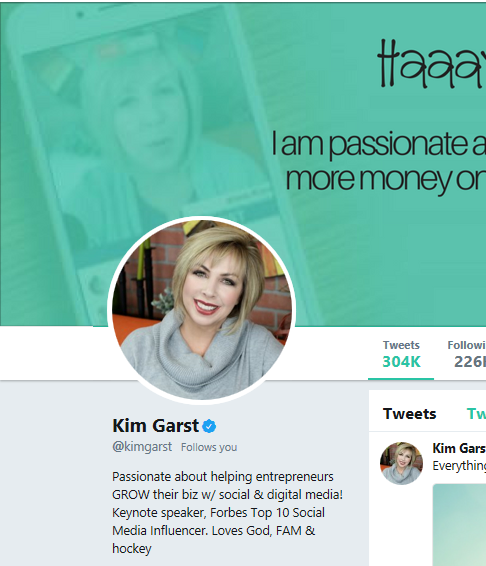 Straight off the bat, Kim mentions “Passionate about helping entrepreneurs”, and then telling them she helps grow businesses. This is a good example of a “what’s in it for me” bio. Did you know there are many types of ways you can publicise your Twitter handle? Print on business cards, flyers, beer coasters, etc. Lastly, try to post consistent quality content on a regular basis. Done correctly, your followers should be looking out for the content you are posting. As I mentioned earlier, use Feedly to curate your content before scheduling your tweets. This will ensure you have a nice steady flow of up-to-date content to show your followers. Studies show that consistently publishing content increases the chance of gaining more followers. If you’re looking to use Twitter for business, there’s a whole host of opportunities out there for you, your business and your brand. The main takeaway from this article is engagement and trying to make as many connections as possible with the people that you follow and those who follow you. Keep in mind, the idea isn’t to get as many followers as possible – it is actually to get as many niche-related followers as you can! How have you increased your followers on Twitter recently? Great article, Des. Keep up the good work! Another useful Twitter article here Des. I especially liked the video you included. I always pick up some new insight from you even if some of the information is already known to me. Thanks for this.